Heading for Pančevo, north east of Belgrade, I open the car window to get some air: the car is full of exhaust fumes from two hours' tailback on the ring-road round the Serbian capital. Pančevo is only 18 kilometres away. I remember the town especially because of the TV footage of the toxic, black cloud surrounding it one day in April 1999. The Nato bombers were relentless towards the great industrial complex in the southern part of the town - refinery, petrochemical and nitrogen factories – causing damage to the environment and the inhabitants' health to a degree as yet unknown. Pančevo was one of the most important production centres in the region. This because of its strategic position, on flat land wedged between the Danube, Tamiš and Nadel rivers, with railway and major road networks nearby. In the period between the two World Wars came the first phase of heavy industrialization, starting with the “Tesla” light bulb factory, a factory producing glass for the building trade and the “Utva” factory making aircraft. Then between the 60s and 70s came the plastics industry and the large new complex of the so-called Južna industrijska zona (southern industrial zone) made up of HIP – petrochemicals, NIS refinery and HIP nitrogen. Pančevo, together with other towns in the Yugoslav Federation like Bor in Serbia and Zenica in Bosnia Herezegovina, rose to a primary position for their pollution and death rates. In the rush to rebuild a country beset by hunger after the Second World War, the priority was economic development and work, quickly and at all cost. Some improvement in environmental conditions took place in 1992, not because the installations were modernized, but due to the international community's embargo of Serbia which devastated the economy of the country: the market was blocked, raw materials disappeared and factories cut back or closed down. The bridge over the Tamiš welcomes me to the town. I park in the pot-holed carpark of the dilapidated but functioning Hotel Tamiš. This eyesore from the socialist-realism period shows the lack of maintenance in its flaking structure. I ask two workmen sitting on a wall smoking where the tourist information office is. They grin at me, as if to say, what on earth is a tourist doing in this “black hole of Europe”, which is how its mayor, Borislava Kruška, defined it speaking at a conference organised in 2004 by Osservatorio Balcani e Caucaso (OBC). In the tourist information office I leaf through the brochure with the council's stamp. It says, “Pančevo, town to the north east of Belgrade. 124,000 inhabitants, 77,000 of whom live in the town and the rest in the villages, in an area of 755 square kilometres, 85% agricultural land.” Then follows information on the churches, parks and agricultural surroundings and a sketched history of the town's transformation into an industrial area. The town suffered 14 Nato bombardments between the end of March and the beginning of June, on chemical plant and deposits. UNEP – United Nations Environmental Programme – in a report in October 1999 on the environmental consequences of the conflict, estimated that 2,100 tons of dichloroethylene, 250 tons of ammonia, 460 tons of CVM (monomeric vinyl chloride), but also chlorine, sulphur and nitrogen oxides were discharged into the environment. Over 8 tons of mercury flowed into the Tamiš, a tributary of the Danube. The Italian city of Ravenna and Pančevo have been in contact since 1994. Caritas in Ravenna began taking aid to the inhabitants experiencing difficult conditions. This relationship was reinforced in March 2001 when the Mayor, Borislava Kruška, spoke at a Conference in Ravenna on the health problems resulting from the war. She asked for help in dealing with the substantial pollution problem in her town. Olga Šipovac, who works in the Secretariat for environmental supervision and Vladimir Delja, the local Councillor responsible for the environment, meet me on the 9th floor of the Town Hall in a large room with an oval table with places for 15, looking onto a vast terrace above the rooftops. On one wall there is a gigantic painting by the Serbian artist Vuk Vučković which depicts the town in grey and black: a “the day after” scenario where flames and atomic mushroom clouds weave through the ruined buildings. “Thanks to a series of steps taken, with Ravenna's help, compared with 10 years ago the situation has improved,” says Delja. “That does not mean that the situation is rosy,” adds Šipovac, giving details on the condition of the inhabitants' health. “True monitoring does not exist. We have made various surveys, using the methodology and standards of the OMS, but there are 2 problems: the shortage of epidemiological documentation of the past and the lack of a methodology of collection and analysis of health statistics at a national level.” In other words, it is difficult to compare the data from other towns and so claim for certain the cause-effect connection between the pollution and sickness. Thanks to the commitment of the Province of Ravenna, in coordination with other bodies in Italy, since 2002 several actions have been taken to improve the environment. Following the monitoring of the air quality, training programmes, information for the public on related themes, school exchanges and town planning activities were set up. Today, this time with pressure from the EU, Serbia has finally set up a national network for monitoring the quality of the air, run by the Agency for Environmental Protection and fully functioning from 2010. The values (in µg/m³, microgrammes per cubic metre) are picked up throughout the country by 39 stations. At Pančevo there are 2, in Sodara and Vojlovica. In the Agency's report for 2011, published last November 14th, the data collected put Pančevo in the third category, that is the worst for pollution. “The first Italian intervention galvanized public opinion. At least today the politicians are scared that Pančevo will say or do something. But the problems remain unresolved. . .”, Nevena Simendić from the local TV says emphatically. Moreover in 2005 a register was set up to facilitate collaboration between the Council, the factories (Nitrogen, Petrochemicals and Refinery) and the Ministry for Education and Technical Development – the Ministry for Power, Development and Environmental Protection did not exist at the time. “Rapid action programmes have also been put in place in the case of air pollution going above the maximum level allowed,” adds Vladimir Delja, the councillor responsible for environmental protection. This would ultimately involve the Inspectors' Office of the State, the only unit which can legally enter the industrial zone, make checks and ask the factory responsible to stop or slow down its work. Furthermore in a high risk area like Pančevo, there are only two inspectors working. “It can happen that when citizens tell us of something anomalous and we call the inspectors straight away, they are working in another area and are unable to come immediately,” Vladimir Delja declares. “The Minister for the Environment, Zorana Mihajlović, during her visit in August, promised to increase the number.” At the same meeting an appeal was presented to the Minister requesting a programme of support for the factories so that they can put into practice the action plans agreed some time previously. 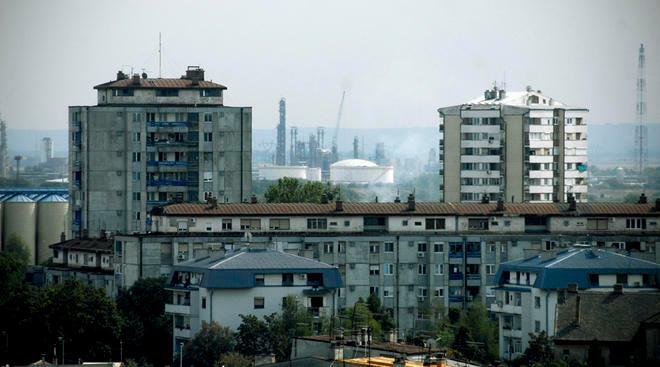 “The problem is not simple,” explains the engineer and Trades Union representative, Zoran Obradović, spokesman for the Union Nezavisnost (Independence) at the petrochemical plant. “The Nato bombardments destroyed 40% of our factory. The State has given us nothing and we workers, who built it and were its owners, were only able to resurrect one of the two destroyed structures. We have begun to work at low regime, with obsolete equipment and great waste of energy.” Thus the petrochemical plant has accumulated debts with Srbija Gas, the NIS refinery and Elektrodistribucija (who supply gas, petrol and electricity) to the tune of 80 million euro. The petrochemical plant is now affiliated with the NIS refinery, with the Russian Gazprom Neft the majority shareholder. When the refinery was privatized an agreement was made between the petrochemical plant, Serbian Government and NIS-Gazprom Neft. The State had the majority at the petrochemical plant, taking on part of the debts and agreeing to invest, while Gazprom Neft took on the petrochemical plant's debts with the NIS refinery and became owner of 12%. From the window on the first floor of his house you see a mountain of rubbish in the open with flocks of birds feeding on it and people with horse-drawn carts searching for waste they can sell. “I've lived here for ten years and they've been telling me to close for all this time,” he sighs. Nor are water and land in a good state. According to the document Strategy for Regional Development of the Serbian Republic 2007 – 2012, the quality of water is in an alarming condition and getting worse. Next to the hospital, alongside the tree-lined avenue and cycle path, Miosa Trebinjca, there is the public park, Narodna bašta, created at the beginning of the 19th century. They call it “Pančevo's lungs” which one can't help but agree with since it is a buffer between the town centre and the industrial zone of Vojlovica. At the entrance there's a plaque saying, “Rebuilt thanks to donations from the Province of Ravenna, Cervia Municipality and Sardinia Water Board.” Thanks to the project “Pangreen” in the Balkans APQ, the green surface area of 10 hectares has been increased by a further 4 and ½ hectares, the interior restructured and endowed with over 20,000 plants. The Ministry of the environment and Planning has listed 180 polluting factories which, by 2015, must sign an agreement obliging them to regulate their activities on the basis of European Directive 2003/105/EC, incorporated into national law. Among these are the three of Pančevo: HIP – Petrohemija, NIS Rafinerija, HIP Azotara. One wonders if three years will be enough. “The road towards the European Union might manage to put pressure on the government and push the firms to meet European standards. But the guidelines must be modified as received, to suit the local situation. Otherwise the risk is it will be impossible for many to work in accordance with the regulations,” Obradović, the trades union representative of Nezavisnost, sustains with conviction. The risk is that who does not have the strength to buy a dustpan to collect the dust will have to close. Or hide the dust under the carpet.